A Dremel (300 Model is used for this tutorial), & Flex Shaft Attachment (Optional), a piece of Basswood - approx 8 x 10 x 2”, Bits: 431 Coarse 1/4" Sanding Band + replacement bands, One narrow High Speed cutter and One High Speed Cutter with tapered end (see picture below for a rough guide on what they look like, as long as they are similar shape they will work), Red Tungsten Carbide aggressive bit (Optional), Print a Free Tea & Coffee Lovers Relief Carving template , A gouge or spoon and straight edge Chisel, Mallet, Pencil or transfer paper, Sandpaper of varying grits, Wood Sealant, Acrylic paints, paint brushes, varnish & wire hanger kit. Here are some of the most important items you'll need to make your carving. I've designed this tutorial with a beginners budget in mind (most bits can be sourced easily or come with Dremel sets and there are alternatives provided for others). If you can't find basswood you can use Pine or MDF board in a pinch. If you want to save some time too, you can ask the lovely people at your local hardware store to cut your board before you take it home. Then all you have to do is sand the edges and face of your wood so that the image is easy to transfer and you're ready to start. Print this template at 100% for an 8x10" carving or at 50% for a 4x5" carving. Luckily, there's a really simple trick for transferring an image if you don't own transfer paper. Scribble all over the back of your print-out with a dark pencil then hold it up to a light to make sure you've covered all of the lines. Line up and attach your template to wood piece using masking or painters tape. Trace the outlines of the template with a pen. Be sure to check that the drawing has transferred and then darken lines with pencil if if they came out a little faint. These will become your cutting guidelines. 3: Gear up with all of your safety gear. You should use safety glasses or googles, a respirator or mask, hearing protection and if you want to wear gloves make sure they are well fitted real leather (cotton or synthetic fibers can catch on the rotating bit at the end of you Dremel which can damage equipment and your hands. Trust me, I destroyed 2 flex shaft attachments while wearing the wrong gloves before I figured out this tip!). Tips: Using this style of respirator keeps my glasses from fogging up because it forces by breath downwards instead of up into my glasses. Also: hanging your Dremel from a sturdy hook or using a Dremel stand will keep the flex attachment from bending unnaturally while you're working. Attach a narrow, high speed cutter to your Dremel to create your first outlines (Just make sure your bit looks similar to either of the ones shown in the photo below you'll be able to do it). I set my Dremel to it's highest speed for almost all of the steps in this carving (I'm working with the 300 model). 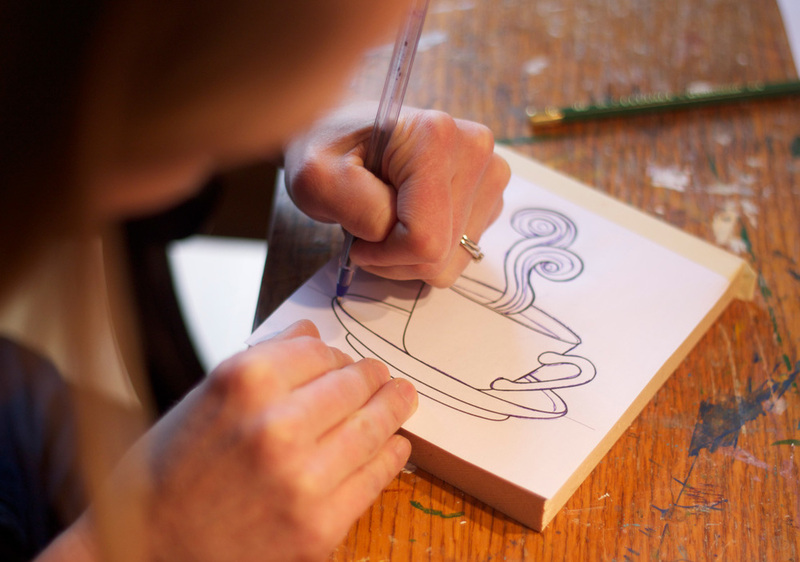 Begin by guiding your Dremel slowly and carefully along the along the outside edge of your pencil lines on the outside of the cup, steam and inside the handle (as in the orange lines in the illustration below). It will take quite a few passes until you reach a consistent depth all the way around the cup, equal to the depth of the bit that you’re using. Chip away the background using a straight-edged chisel and mallet. When you get to the little piece inside of the handle be very gentle, just press your chisels handle with the palm of your hand- too much force will take the handle next to it right off! 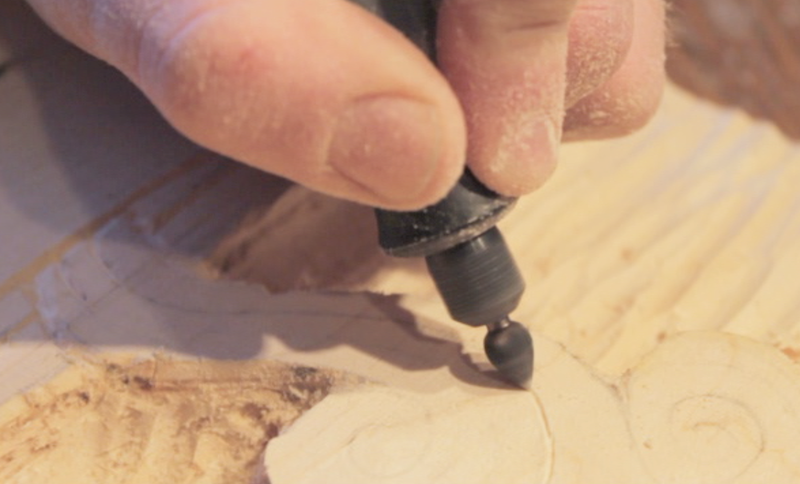 Tip: If you want to achieve a consistent depth, you can measure and mark the depth you are aiming for along the outside edge of the carving using a ruler and pencil (I personally just to eye-ball it). Decide now what final texture you want your background to have. You can leave it all chunky and ragged (gasp! what? !, no really, I have and it looks great painted! ), carve out scoop marks with a gouge or spoon shaped chisel, or make it really smooth with a band sander bit or use that beautiful red Tungsten Carbide Bit to carve interesting grooves quickly... There are so many choices! Look through my gallery of finished work for different background ideas because I've experimented with many different looks. Safety Tip: When using chisels, you may wish to switch to carvers gloves made of Kevlar (like mine, the yellow gloves with black dots) or Steel mesh. Just make sure not to use these gloves with your rotatory tool. You can use your straight bit on an angle or attach a tapered bit and carefully trace the lines several times until they are crisp and defined grooves have replaced your pencil lines. The tapered bit is also good at beginning the process of rounding the edges of each object in your piece. *Holding your tool at an angle rather than perpendicular to the board allows for better control over and around contours. 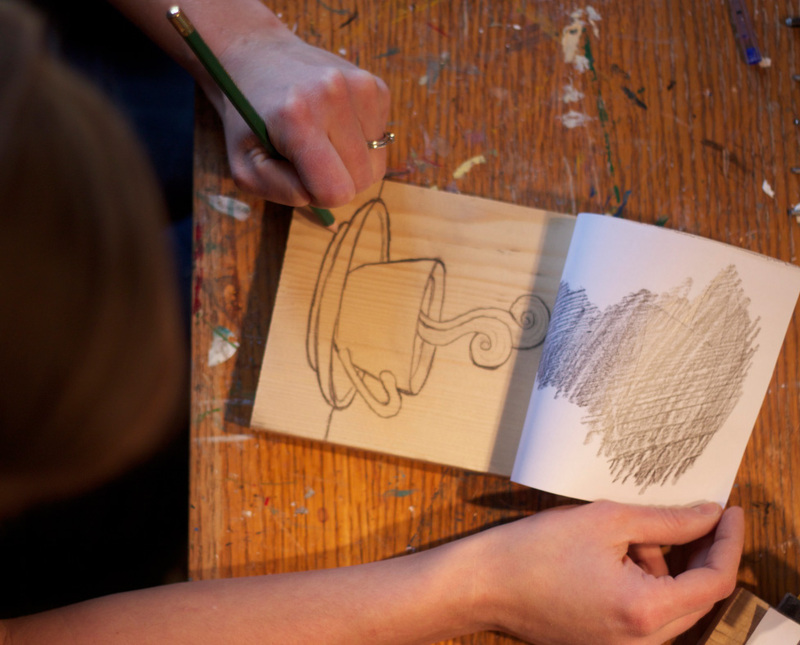 Now your carving can start to come to life! 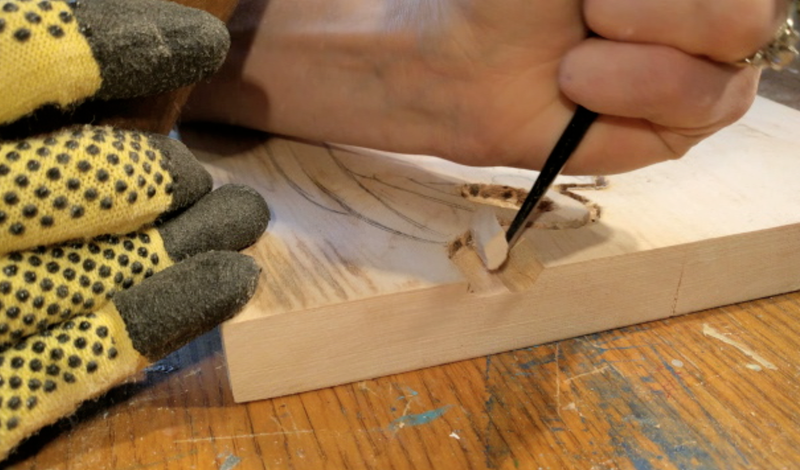 Attach a band sanding bit, and using gentle pressure, start rounding your edges and create some depth by going slowly around all of the edges, varying the angle that you hold your Dremel at. Keep in mind that you want to keep the steam, cup and outer rim of the saucer as your highest points and everything else can be slowly pushed back using the sander. If you're nervous about this, you can use this photo as a quick guide for what should be behind what and what should be rounded. Crisp up your lines one last time with your tapered high speed cutter. Or perhaps you’d like to add some fun details to your piece - Dots? Lines? Flowers? Swirls? A Monkey on a cup? If a fuzzy texture has crept into some areas in your piece (as you can see here on the table under the saucer), you can sand it smooth by hand using varying grits of sandpaper or use a sharp chisel to clean the edges off. 9. Clean your carving using an old toothbrush, brush or damp rag to get rid of all of that left over sawdust. Even if it's kinda sparkly and fun. A) If you don’t feel like showing off your amazing painting skills then apply a stain to it. B) If you’re going to paint your piece then you should seal it with a clear wood sealant such as DEFT wood sealant (you can spray it into a bowl and then brush it on) or use an opaque wood primer and sealant in one, like my sample, checking that you’ve painted all of the grooves. 11. Time pick your colors, mix up your paint and apply! If you wish to copy my sample color palette: I created a teal background using a mixture of cobalt blue, titanium white, cadmium yellow and touches of forest green. The white mug is made with titanium white, mars black, cobalt blue and touches of the pre-mixed teal used in the background. The table is a mix of various browns - burnt umber, cobalt blue, cadmium red, cadmium yellow and a touch of mars black. First paint blocks of solid color in each section of the piece. To create depth and to vary the hue and value of the piece, mix up lighter and darker hues of each color on a palette. Using a dry-brush technique, gently brush lighter hues for highlights and darker hues for shadows/contours around your piece. Allow your painted piece to “sit and cure” for 1-2 weeks, varnish with a UVLS protective varnish in gloss, matte or satin, add a wire hanger to the back (you can buy a kit for these at an art supplies or framing store)... and You’re done! I'd love to see what you've created from this tutorial and so would Dremel. Share your photographs with us on Dremel's facebook page , my facebook page, or share them on your social media page using the #Dremel. 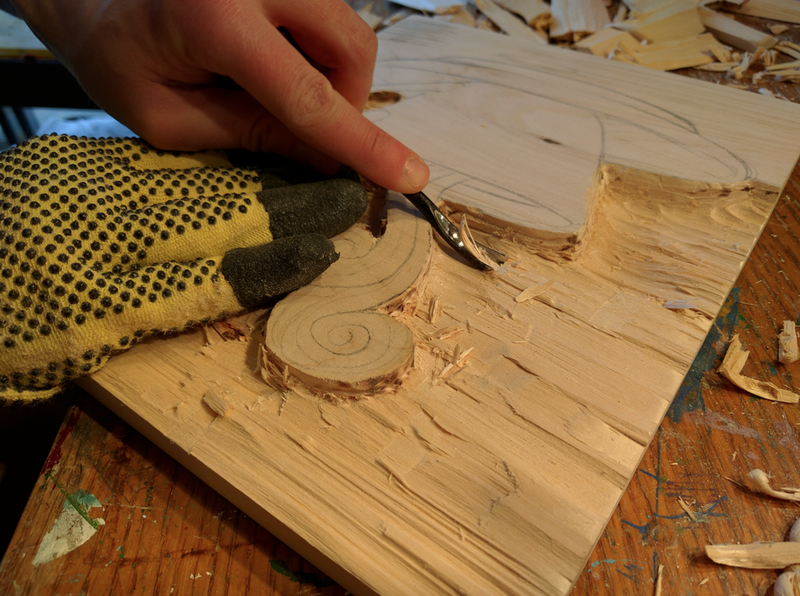 If you want to get more carving tips, find out about my new shows and upcoming online art sales sign up for my newsletter. I would like to express my deepest thanks to Dremel for supporting artists and makers like me by providing the funding to create this tutorial. It's an honor to be an official Dremel maker. If you want to get even more carving tips, find out about upcoming shows, online art sales and be entered to win draws for prints sign up for my newsletter. Thank you so much for signing up for Crystal Driedger's newsletter. Look forward to monthly posts with carving tips, new artwork, sales, giveaways and more! 24x32" on Basswood. Will be at the Quiet Moments Solo Show at the Milner Gallery in Edmonton in April 2016. Crystal Driedger. Mixed Media illustrator and artist. For tips, new art, sales, giveaways and more sign up for my newsletter. We respect your privacy. Emails are never shared with a third party.